… I saw and did for the first time in 2014! It’s possible my definition of ‘cool’ isn’t the same as yours. I think it’s quite easy to find something cool downunder – anything new, intriguing, scenic or exclusive to OZ (or the world) does it for me. So if you’re wondering about some of the inclusions in this selection of 12 cool things I saw for the first time in my travels through five Aussie states in 2014, that’s why they’re there! This little island off the eastern coast of Tasmania is about the same size as Singapore. But whereas Singapore has a population of 6,000,000+, Bruny Island is a LOT less crowded with only around 600! 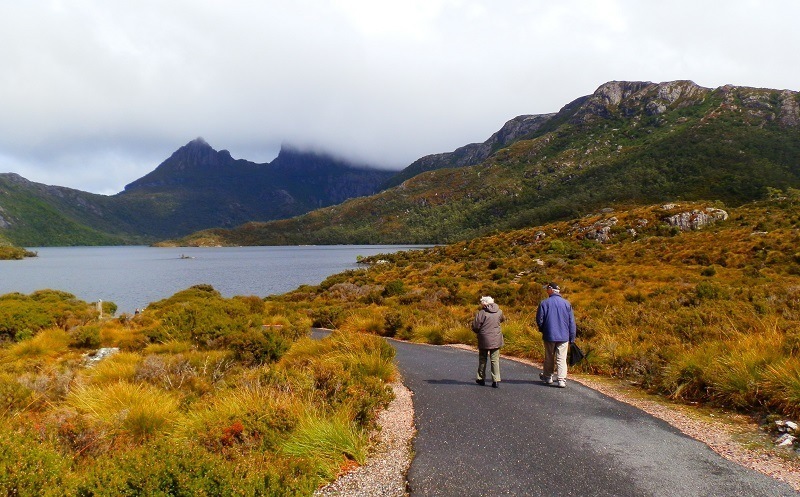 Stunning scenery, including the 2nd highest cliffs in the Southern Hemisphere and one of Australia’s most scenic public loos; wonderful wildlife – think seals and Tasmanian endemic birds – AND fabulous food means a day trip isn’t nearly long enough to see everything. And I’ve never been on a waterway with a name as cool as the D’Entrecasteaux Channel! We got to see Tasmania’s most famous mountain on a ‘normal’ day. And that meant cloud, fog, mist, drizzle, rain, wind and the coldest temperatures we’d experienced in Tasmania to date! Apparently, those typical images of Cradle Mountain’s classic shape reflected beautifully in Dove Lake below (click HERE to see what I mean!) only happen on one or two days in every ten! SO … I guess we were lucky. Because MY shots show the real thing in all its non-clichéd glory! Right?? I’ve seen wombats before. I’ve even been bitten by a wombat!! But 2014 was the year I first saw Vombatus ursinus tasmaniensis, which the informed will instantly recognise as the Tasmanian Wombat – a sub-species of the common wombat. The lesser informed might think it a visitor from another planet with its odd shape, shambling gait and its legendary ability to burrow underground in the most inhospitable places. Most Australian women know a ‘wombat’ – the name’s often given to a bloke who, like the wombat, eats roots and leaves. I don’t know if the Tasmanian wombat shares these habits with its mainland counterparts. But … I’ll bet a few Tassie blokes do! It’s not that easy to see the world’s highest volcanic rock stack up close. First, get to Sydney. Then take a ~600 km flight to Lord Howe Island which, depending on the crosswinds on the airstrip bisecting the island, may or may not be able to land. Then wait for suitable weather conditions for the 23 km boat trip across the open ocean to the Pyramid – there’s a 50% cancellation rate. 66.66% if you’re as unlucky as we were with a FAIL on our first two attempts! But finally the planets aligned and we gazed in awe at Balls Pyramid’s distinctive twin spires towering 551 metres above us. And in an uncharacteristically speechless moment, I ran out of superlatives! After rats invaded Lord Howe Island following a shipwreck back in the dim, distant past, the endemic Lord Howe Island Phasmid – a large stick insect – was thought to be extinct. But many years later, it was re-discovered on the inhospitable and rugged Balls Pyramid (see above!) by a scientific expedition. Luckily, we didn’t have to climb or camp on Balls Pyramid to see this rare creature for ourselves – there are a couple in the Lord Howe Island Visitor Information Centre. And call me shallow, but seeing something that’s been brought back from extinction AND that not many others have ever seen gives me a BIG thrill! 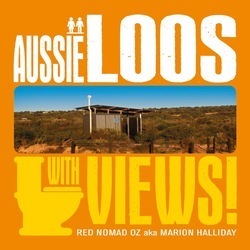 Seeing my name on my first book – Aussie Loos with Views! – was one thing. But seeing myself on TV was quite another! My first (and possibly ONLY) TV appearance to promote my book on Weekend Sunrise may or may not fit YOUR definition of ‘cool’. I’ll leave you to judge it for yourself! To watch the video: Hover the cursor over the bottom of the picture. Click on the Forward Arrow symbol that will appear in the bottom left hand corner. There’s about 15 seconds of ‘sponsor messages’ before the interview starts. *IF you received this post by email, click on the link to the blog post at the top of the email – you won’t be able to watch the video from the email. MORE about Aussie Loos with Views! I’m SO not a morning person that it wouldn’t be far wrong to say that seeing ANY sunrise ANYWHERE was a first for me. But the sunsets were so spectacular near our campsite on our first visit to Lake Moogerah that I braved the cold and dark to see what I’d normally be missing. So what’s a few bleary eyes and frozen fingers when sunrises in the superb Scenic Rim region look like THIS? We took a day trip from Woodenbong along the notorious Mt Lindesay Road (arguably Australia’s worst) to Queen Mary Falls in the Main Range National Park. From there, the road winds upwards for 7 km to a vantage point 1005 metres above sea level overlooking the spectacular scenery of Condamine Gorge. Who even knew there WAS a Condamine Gorge? An embarrassing admission given it’s strategic importance as the headwaters of the Murray/Darling river system that reaches the sea in my home state, South Australia. We decided to forego the pleasures of the 4WD Gorge track and its 14 river crossings in favour of morning tea at the Spring Creek Mountain Cafe. All in the interests of seeing more of that stunning view, of course! A fully restored – and fully functioning – Art Deco cinema complete with café and a musuem dedicated to its Greek heritage was an unexpected bonus in small-ish New South Wales country town Bingara. And when we decided to stay for a few days and explore the area, we lucked out. Dinner at the Café, a look through the museum and an excellent show from Song and Dance Man Mike McClellan showcased the Roxy’s awesome attributes superbly. But next time I’ll take a tripod for some blur-free interior shots! The 50 km drive over a bone-jarring, dusty, rocky station track heading due north from tiny Riverland settlement Taylorville to Gluepot Reserve took over an hour and a half. But deep in the South Australian mallee surrounded by sand dunes and spinifex, we entered a world of walks, wildflowers and wildlife. Who cared that we didn’t see any of the 5 ‘lifers’ that birdo Pilchard hoped to find on this once- pastoral property, when a walk in the early morning light showed the beauty of this harsh, arid landscape? And it didn’t matter that our camp shower malfunctioned in the middle of our stay when the flowering eremophilas were so abundantly spectacular. Even the thought of facing that long, rugged drive on the way home wasn’t enough to faze us. Why would it? This is Outback Australia at its BEST! A whole lot of large white birds resting on a rocky knoll a few kilometres from Victorian coastal town Portland was interesting – but you’re probably thinking it’s not THAT exciting. Every now and then a few of them would take off, swooping, soaring and generally showing off against a bright blue sky in a completely non-photo-friendly way. But this cacophony (or whatever the correct collective noun is) of Cape Gannets on Point Danger (cool name, huh?!) is the only mainland Gannet colony in Australia – a spillover from the rugged Lawrence Rocks colony, just two kilometres offshore. It’s rare to see so many gannets up this close without being out at sea. And the stretches of staggering scenery along this part of the coast are an added bonus – especially if you’re a non-birdo!! 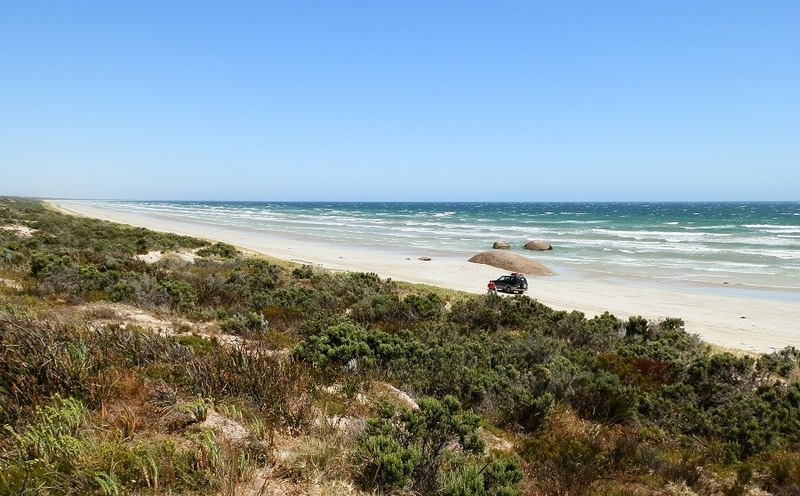 You can’t see the wild and rugged scenery of the Coorong – Australia’s longest beach – from many places on the long drive along the Princes Highway that parallels the coastline en route to Adelaide. The 194 km (120+ miles) of sand, unbroken except for a collection of three random boulders 15 km north of of Kingston South East. So as we returned home from another Australian exclusive – a sighting of the first Long-billed Dowitcher ever recorded downunder – we took the short detour to see them. Apart from sand dunes and waves stretching out to the horizon and a 4WD that just WOULD NOT GET OUT OF MY PHOTO, there’s nothing much else along this vast and empty beach on the edge of the Great Southern Ocean. Except for the view. AND these three random granite boulders. Now … see if you can guess why they called this area ‘The Granites’!!!! So that’s 12 of the cool new Aussie things I saw and experienced in 2014. 2015 has already been exciting with a week in a retirement village, a narrow escape from a bushfire and the threat of floods! SO … what cool things did YOU see and do in 2014?? « 12 HOT Aussie Sunsets … and a Sunrise! Back in January I posted a number of pictures of red farm machinery and thought of you. Your list is quite engaging. Would love to come tour in your country. How terrific. I started reading this post with a lot of confidence thinking that perhaps I would have experienced a number of things on your list of 12. My confidence was buoyed even further when I could check off numbers 1 and 2. However, almost everything else was unheard of for me. What a great wrap for your year, and an inspiration for many of us, I’m sure. Carry on! OMG! Look at those colours at Point Danger! The scenery along the coast in both directions from Point Danger is staggering, Yum! You’ve GOT to see it one day!! Glad you liked them, Jo-Anne! I could easily have given you 50 cool things I saw in 2014 – look forward to sharing more!! I just watched the Sunrise interview, Red… you’re gorgeous! Seriously. I didn’t do ANYTHING as cool as you in 2014. So, I live vicariously through your blog. Oh my goodness, what a wonderful collection of experiences and vistas! Bruny Island is definitely on my bucket list. We have friends who have a ‘shack’ there. Talk about envy! For me, your book is so cool. I suppose there are many bloggers who hope to publish books some day, and you proved that it’s possible! Thank you Kozue! It’s lucky for me that no one else wanted to publish a book about Aussie Loos!! Have a great week ahead! Well that must be the best of the best sights of 2014. They are fantastic and I am quite envious of your trips around Oz. I mustn’t grumble too much as 2014 was the year I walked in Darwin’s footsteps and viewed the wonders of the Galapagos Islands. Thank you Fun60! It certainly sounds like 2014 was pretty amazing for you too! I’m often envious of people who’ve been to places I haven’t been – but it doesn’t stop me from appreciating where I am AND knowing people are envious of me! Look forward to seeing where you end up in 2015! So many wonderful places I’d like to visit, but can’t, so I’m very glad that you do and take photos for us to see. I’m very glad about that too, River, and I look forward to showing you the sights of 2015 (but not the bushfires!)!! Thank you for being one of my most faithful readers!! I’ve only seen the turtles laying once – back in 1999 on Mon Repos beach near Bundaberg! I’d love to see it again. I’ve been reading your posts about your US travels with great interest – and if that’s ‘slowing down’ then bring it on, Diane! Sounds like you had quite the year Red! Love the Lake Moogerah shot, I will join you on the embarrassing admission on Condamine Gorge (but it’s near my house, so thanks for the tip!) and didn’t know Coorong beach was Australia’s longest. Nice to see a face behind the blog too. Hope your books sales rocket. I actually look back on 2014 and think it was quite a flat year for me, but I suspect this year will be a little different. It’s funny – we didn’t cover as much ground as we often do, but it feels like we saw a lot more! I’m sure there’s a lesson in there somewhere!!! I’m looking forward to seeing how 2015 pans out for you, Andy – you’re WAY more adventurous than I am!! Maybe not so much #10 but they are all great. I did not know Tasmania’s wombat was different to the mainland wombat. Don’t tell me there is more than one mainland wombat. It is hard to beat Tasmania for being photogenic. I have just run through my mind last year’s events and I don’t think we saw anything really. Must remedy that this year. Oh? What’s wrong with #10??? Haha, only kidding … I know the Outback & Birding aren’t everyone’s thing 😀 And I think you’ll find Tasmania’s EVERYTHING is different to the mainland version (well … almost!). Looking forward to 2015 – hope you are too! Yes I would say those 12 things are pretty cool. The sunrise at Lake Moogerah is incredible, as is the photo at Cradle Mountain. Encounters with wildlife is always up there as being pretty cool too! However I couldn’t get your video to play and I would love to check that out. My 2014 year comprised of a trip circumnavigating Australia and I couldn’t possibly narrow it down to ’12 cool things’ but one of the standouts was swimming with the Whale Sharks at Exmouth. I´d replace #9 (though never been there, ignorant me!) with Broome´s Sun Pictures. The Granites look impressive, too, and the last pic… awww, SO reminds me of our travels! And the trees look like broccoli, I think. Nothing half spectacular over here in 2014. 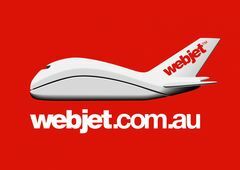 But we´re off to Perth, soon (sadly only Perth, I still did not play, hence not win big in lotto).